The stainless steel single door combinable floor standing enclosure range, MCSS, with a IP 56 protection degree, is available off the shelf in many different sizes. The risk for component failure, and with that unnecessary downtime, is eliminated as water and dust are prevented from entering the enclosure. This enclosure range is well suited for almost any environment, grade dependent. AISI 304L pre-grained stainless steel / AISI 316L. Frame: 1.5 mm. Door: 2 mm. Rear, roof and side panels: 1.5 mm. Bottom plates: 1.5 mm stainless steel. Mounting plate: 3 mm galvanized steel. Seam welded reversed open profiles with 25 mm hole pattern, according to DIN 43660. Mounted with four hinges allowing left or right hand opening. Including door frame with 25 mm hole pattern. Fitted by M6 torx screws. Standard facilities for rear door mounting. Espagnolette 4-point locking system. Does not interfere with the enclosure inner space. Standard double-bit 3 mm insert. Standard inserts, cylinders, lift handles and T-handle are available as accessories. One piece bottom plate, with injected polyurethane gasket to ensure maximum sealing. Double folded and slides into position. Adjustable in depth by steps of 25 mm, with the MPD02 accessory. Mounting plate is supplied, attached on the outside of the enclosure packaging. All panels are earthed through their fittings and are equipped with a separate earthing stud. Corresponds with IP 56 | TYPE 4X, 12, 13 | IK 10. Standard delivery ready for combined installation. For stand-alone installation, add side panels. Frame with fitted door, rear panel, roof panel, bottom plate, mounting plate and door frame. Delivery also includes earthing bolts. Delivered on a pallet which is identical to the width of the enclosure to allow baying without removal. All packing material is recyclable. 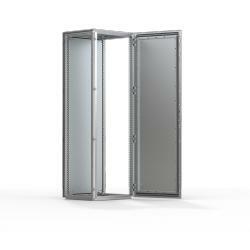 Stainless steel 304 and 316(L) single door combinable floor standing enclosures, with a IP 56 protection degree. A flexible solution where customers can choose enclosures that meet their size requirements, off the shelf, in order to create enclosure configurations made up of smaller individual enclosures. The installed components inside the enclosure will be safe and secure due to the high protection degree. Customers can receive enclosures with a short delivery time, that match their size requirements. This will also remove any extra costs due to oversizing. Component failure and unnecessary downtime is avoided as water and dust are prevented from entering the enclosure. Stainless steel enclosures can be installed in almost any environment, grade dependent. Stainless steel side panels, SPMS, need to be ordered separately, to close individual enclosures and enclosure assembly's, to ensure the stated protection degree is achieved.